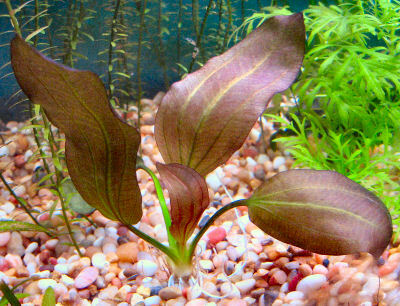 Aquatic plants need to have water with specific macro and micro nutrients, as well as the proper water hardness and pH, in order to be healthy and contribute to the overall well-being of the aquarium. In addition to light and heat, water is the plants' vital element and it must to be attuned to their needs. It is important to learn about the types of plants you want and the quality of water they require. When choosing plants, keep in mind that different species can have different water quality requirements. However members of the same species will have similar if not identical requirements. Choosing like groups of plants can make plant maintenance and a thriving planted aquarium somewhat easier. Many macro and micro nutrients are needed for plants so that they can produce pigments (mainly chlorophyll) to use during photosynthesis, and most plants also need a harder water. Hardness: The hardness of the water depends on the amounts of dissolved minerals and salts, mainly magnesium and calcium. Both total and carbonate hardness are a consideration when determining if the water is suitable for certain plants. Carbonate hardness is even more important than the total hardness. Total hardness is the sum of the magnesium and calcium metals present, while carbonate hardness comes from hydrogen carbonates and carbonates (which come from the carbonic acid produced from the magnesium and calcium salts). The carbonate hardness for plants should be about 3 to 10 dCH. Most plants need harder water, but if you have species that need softer water, it can be softened by either ion exchange or reverse osmosis, accompanied by addition of tap water (to increase the salinity) until the hardness is where you want it. Reverse osmosis and ion exchange equipment to perform these methods can be found in pet stores. pH: The pH also often depends on the carbonate hardness of the water. If there is not enough carbon dioxide in the water for the plants to use in their photosynthesis process then they will often extract it from the calcium and magnesium in the water. This can significantly raise the pH of the water, causing harm to the fish. However, carbonates in the water act as buffers, which keep the pH from changing drastically. Therefore, it is necessary to measure the carbonate hardness regularly. Performing regular water changes will help to keep the water's buffering capacity high. Oxygen: All organisms, including plants, need oxygen to breathe. Plants can take it up in the form of water, carbon dioxide, and as dissolved elemental oxygen. Most of the oxygen they take up is through respiration and through their roots. They also release oxygen during photosynthesis, which helps provide it for the fish. Optimum oxygen levels in the water are usually between 5 and 7 mg/L, and can be achieved by having a healthy population of plants that produce oxygen (with proper lighting supplied) as well as a healthy population of fish. An oxygen gas equilibrium also occurs between the air and water, and so oxygen will be dissolved into the water from the air or vice versa if there is a deficit or surplus. However this is a slow process and if the fish and plant populations aren't at an optimum level or if too much or too little light or nutrients are supplied, an oxygen equilibrium will never be reached. If you suspect that the oxygen level is off, test kits are available in many pet stores to check the levels. Carbon Dioxide: Carbon dioxide is an extremely important plant nutrient. Plants need it for their photosynthesis processes to provide themselves with food and energy, and therefore they must have carbon dioxide to survive. Plants can take it up through their roots, but most of it is taken in by their leaves directly from the water. It is present in water due to the breakdown of organic waste and also by the respiration of both plants and fish. Test kits are available to test the levels, and normally some type of carbon dioxide addition is needed in the water. There are carbon dioxide fertilizing devices that can release small amounts of carbon dioxide continuously over time if there is a deficiency. Nitrogen: For aquatic plants, nitrogen is an extremely important nutrient in carrying out photosynthesis. It is used mainly to synthesize nucleic acids and proteins. Unlike land plants they cannot use large amounts of it in the form of nitrates, nor can they take it up in its elemental form. Instead, they mostly take it up as ammonium, which only exists in water with a fairly low pH. You must be careful that the pH does not change quickly from low to high, since ammonium will be converted to ammonia by bacteria in the biological filters and cause harm to the fish. To make sure the correct amount of nitrogen is available, perform water changes on a regular basis and add fertilizer regularly. Another important factor is to make sure that the aquarium has a properly working biological filter to reduce the ammonia that may occur. Nitrogen test kits are available in pet stores to help you determine what level of nitrogen you have in your aquarium. Healthy nitrate levels are usually around 25 mg/L. Potassium: Potassium often creates problems if there is not enough of it available for the plants. It serves several functions, including photosynthesis, producing proteins, aiding seed and root development, and battling diseases. It affects the overall appearance of the plant because if it is not taking in enough potassium, it becomes weakened overall due to the fact that potassium is needed in so many functions throughout the plant. To ensure there is enough potassium for the plants make sure to fertilize regularly. Different fertilizing methods are available, such as liquid drops and slow releasing bottom fertilizers. Calcium: Calcium, for the most part is available in the correct amounts in aquariums. It is needed for cell growth and structure in plants but there is usually enough in the surrounding water. You should be careful if you are using only reverse osmosis water or natural rainwater because these may not have enough calcium in them. The best remedy to low-calcium water is to use substrates that contain some calcium, such as gravel-based substrates, and to use tap water as the main water supply. Magnesium: Magnesium is important for producing chlorophyll for photosynthesis, as well as to activate certain enzymes. Levels should be around 5 to 25 mg/L. Most hard tap water has sufficient magnesium levels but if you live in a soft water area you may want to consider using nutrient-rich substrate additives or liquid fertilizers. Too high of magnesium levels can cause problems with the plants taking up other nutrients however. Phosphorus: Phosphorus is needed to keep the roots and flowers of plants healthy and also to make enzymes and other important compounds. Plants need their phosphorus in the form of phosphates. They do not need large amounts of it, so generally you do not need to worry about a deficiency of it in the water, however a surplus can be a problem. Surpluses often occur due to large amounts of uneaten fish food and this often creates algal blooms. The best remedy to this is simply to do regular water changes. Sulphur: Sulphur is used (once again) for producing chlorophyll to be used in photosynthesis and also to produce proteins and amino acids. It is taken in the form of sulphates and is usually present in sufficient quantities in aquarium water. It can be added by using soil-based substrates or fertilizers. Carbon: Carbon is needed to build the basic structure of plants. It is mostly taken up in the form of carbon dioxide, which is broken down during photosynthesis. See carbon dioxide above for further information on how to keep correct levels of it in your aquarium. Micro nutrients are needed in very small amounts and so are generally not as big of a problem as macro nutrients. Usually, the normal aquarium environment provides the necessary doses of these nutrients for plants to stay healthy. They are needed in plants to help in many different jobs, such as cell structure, enzyme synthesis, photosynthesis, respiration, regulation of metabolism, and several other functions. If you do find that it seems that there is a deficiency of one of the micro nutrients, ways to increase it include fertilizing, using nutrient-rich substrates, and using tap water when changing the water. Many elements that are needed for plant maintenance are present in tap water as well as part of the planted tank substrate. Regular water changes with tap water, adding fresh water aquarium fish, fertilizing with aquarium plant food, and the addition of an aquarium co2 systems are some of the ways to add and replenish necessary nutrients in your planted aquarium. For more on providing nutrients to the planted aquarium see: Aquarium Plant Feeding and Maintenance, Plant Food and Aquarium co2 Systems.